It took 15 years but Ray..
For more than 15 years Ray has been campaigning for a solution to one of Sydney’s worst traffic problems… the Galston Gorge. 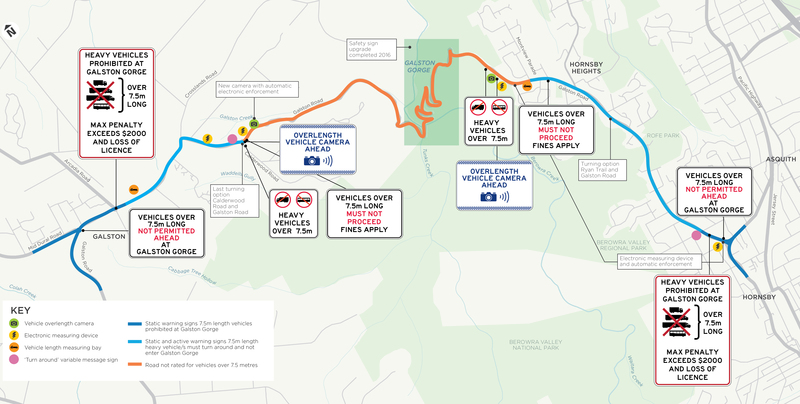 Just about every week, an overlength truck will enter the gorge and get stuck, cutting off thousands of residents in Sydney’s north-west and causing detours of more than 30 minutes. Three successive governments have put in band-aid fixes, installing signs and increasing potential fines, but still failed to fix the problem. Now, new cameras are about to be switched on that will use radar and infrared technology to measure the length of trucks. Drivers who ignore the 7.5-metre limit face losing their licence and a $3,740 fine. Roads Minister Melinda Pavey has thanked Ray Hadley for his involvement in forcing the change. “This is technology that is world-leading and it’s been hard for the team at RMS to get it right. Ray also questions the Minister on new digital licences available on smartphones and the impact it will have on older drivers.